Belial, one of the Lesser Evils also known as the Lord of Lies, is the act boss in Act II. Belial had once been a protege of Mephisto, honing his powers of deception under the Lord of Hatred's guidance. Eventually, he would turn on his mentor and manipulated Azmodan into leading a revolt against the Prime Evils, though this may have likely been indirectly encouraged by Mephisto himself. With the armies of Azmodan and Belial unified, the Prime Evils were cast out of Hell, though at the expense of a full third of Hell's demons. Azmodan and Belial were left to vie for power over the Burning Hells, a conflict Belial ultimately lost. Years later, much like the Prime Evils, Belial would turn his attention to Sanctuary and corrupting its populace. His influence over the mortal realm mirrors Mephisto's own of twenty years prior, as his power over Caldeum, capital of Kehjistan, was nearly complete until he met an untimely demise at the hands of the nephalem. 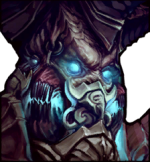 He later became a part of the Prime Evil, who was defeated, again by the nephalem. He is within the Black Soulstone at this time. The Brothers fought with all of the savagery of the Underworld, and to their credit, annihilated a third of Hell’s treacherous legions. In the end, however, they were overcome by the Horned Death led by the traitors Azmodan and Belial. The Prime Evils, weakened and bodiless, were banished to the mortal realm where Azmodan hoped that they would remain trapped forever. 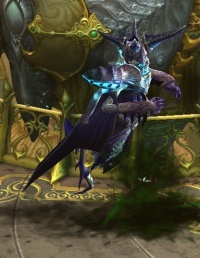 Azmodan believed that with the Three set loose upon humanity, the Angels would be forced to turn their focus upon on the mortal plane - thus leaving the Gates of Heaven abandoned and defenseless. Those few demons who still pledged allegiance to the Three Brothers fled the wrath of Azmodan and Belial, escaping to the realm of Man to seek out their lost Masters. The Belial boss encounter is in three phases. Each phase is broken down below. Belial does not take part in phase 1, opting instead to call in the troops. He'll summon a large amount of Veiled Sentinels and Veiled Evokers to challenge the player. The sentinels just have a melee attack, the evokers have the magus ability to wiggle around a lot and summon a ring of electricity that damages anything inside of it. They both retain the snakeman ability to vanish and then re-appear. After the snakemen prove to be fairly ineffectual, Belial himself drops down into the throne room to battle the player. Snakemen are still spawned later on during this phase, and drop a good amount of health globes. Belial himself has a few abilities in phase 2. Fireball - Belial launches three fast-moving fireballs along the ground at medium range. They are green and black, and probably not made of fire, showing that Belial really is a liar. Melee Attack - He has a basic melee attack in this phase that hits for low damage. Reinforcements - Belial will call in more snakemen to challenge the hero. They drop health globes. When Belial is at under a quarter health, the final phase begins. Phase 3 is when the real fight begins, and Belial gains a lot of new abilities. 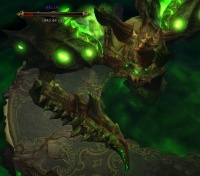 Ground Pound - A ring of green appears on the ground where Belial is about to strike. He'll strike three times, with the last being him pounding the ground with both arms. The first strike is off to the side of the player, allowing for some wiggle room. The last two happen in the same location (where the player is). Poison Breath - Belial will breathe a poison cloud from one end of the arena to the other. It leaves no lasting effects, as it only deals a small amount of damaged compared to the other goodies he packs. Belial is in some way involved in the following achievement(s). http://www.youtube.com/watch?v=jexsWgaS51E&noredirect=1 - Guide on killing Belial. Maghda - Forcefield, Summoning Ritual, Punish, Moth Dust, Teleport. Zoltan Kulle - Fiery Boulder, Time Bubble, Ceiling Collapse, Energy Twister,Vanish, Creepy Laugh Belial - Phase One: Triple Fireball, Summon Vipers. Phase Two: Poison Meteors, Ground Pound, Lightning Strike, Lightning Breath. Ghom - Acid Slime, Sneeze, Gas Cloud, Chomp. Siegebreaker - Triple Hit, Charge, Leg Stomp, Grab and Throw. Cydaea - Pain Bolts, Web Trap, Spider Pits. Azmodan - Bellyflop, Laser Attack, Falling Corpses, Demon Gate, Pool of Destruction, Globe of Annihilation. Rakanoth - Cleave, Teleport Strike, Blade Strike, Volley, Summon Minion. Izual - Frost Nova, Frozen, Summon Minions. 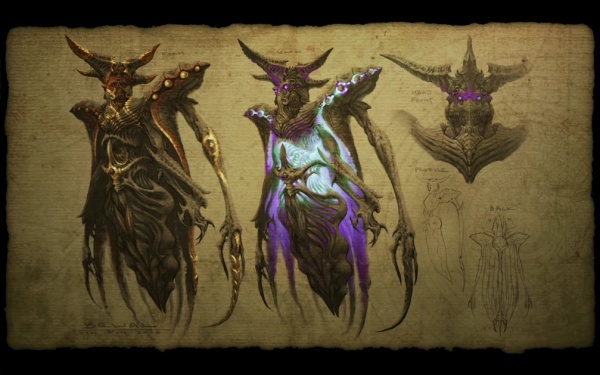 Diablo - Phase One: Claw Rip, Charge, Hell Spikes, Shadow Vanish Grab, Curse of Destruction, Ring of Fire, Ground Stomp, Curse of Anguish, Curse of Hatred. Phase Two: Shadow Clone. Phase Three: Overdrive, Lightning Breath. This page was last edited on 6 May 2014, at 16:13.